Naxos is the perfect island for a vacation and the NAXOS VISION Car Rental Company is glad to offer you the possibility to see the beautiful island of Naxos on your own, in a safe and comfortable way. Our Central Office is near the Post Office. 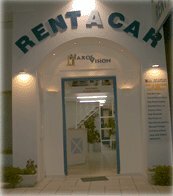 We are a long established car rental company and we can therefore offer you the best choice available.